[Updated 10Aug 2015] PRC’s pei-du mother accused of having an affair with a local man. “Study at 36 years old after being away from studies about 18 years and especially wanted to fight with the elites from China to be top of the cohort and “A” student is not a joke…….” – Latest family tragedy, a manifest of how a Singaporeans Ken Ong coped with the changing economic hardship who ultimately had taken his life as well as his wife. Thank god he did not take his little young ones with him unlike in some other family tragedies. A Singaporean quarrelled with a Philipino woman who allegedly overheard calling the bus driver “stupid”. Philipino nurse Ello Ed Mundsel Bello wrote that Singaporeans are “loosers” (losers), and that he was “praying that disators (disasters) will strike Singapore”. In a statement to the media on Friday night, TTSH said Mr Bello had joined the hospital in October and was under probation when he made the “offensive online comments”. Askmelah’s comment: it is really stupid to bite the hand that feed and then lie to the police claiming the Facebook account has been hacked. These “foreign talents” simply just do not learnt from so many idiots before them. The recent spates of new immigrants/foreigners getting involved in a series of verbal spats with Singaporeans could be the beginning of the social tension in Singapore caused by a combination of liberal immigration policy and foreign labour policy of Singapore Government. when the new grads as well as the middle age workers, the old folks are seeing employers spurns the locals and hire in drove cheaper, younger and more willing foreigners and “new” immigrants, the temperature boils. It certainly does not help when some of these arrogant immigrants ask us to get a life and extol that they are welcome by our Government, it is no wonder the anti-immigrant sentiments are at the all time high in Singapore short history of less than 50 years since independence. Singapore has always been an immigration society and this is not something new and most Singaporeans have long accepted immigrants quietly. It is the pace in the last few years that cause an uproar among the citizens and if left unchecked with lax immigration policy, the consequence could be disastrous! After the watershed 2011 election, PM Lee said: “many Singaporeans wish for the government to adopt a different style and approach. We hear your voice. The PAP will learn from this election and put right what is wrong.” While the Government definitely trying frantically to stem the outburst with a series of policies to clamp down property prices and give more benefits to Singaporeans, the problem is the floodgate was opened too wide in the previous five years and the impact is still being unravelled as we speak. 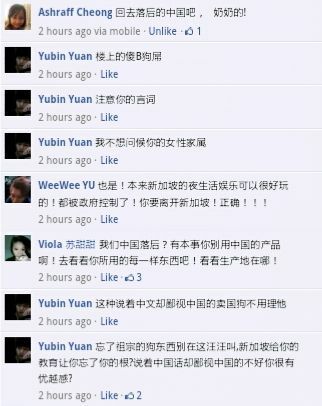 Singaporeans are up in arms over a foreign scholar’s derogatory comment that “there are more dogs than humans in Singapore”. 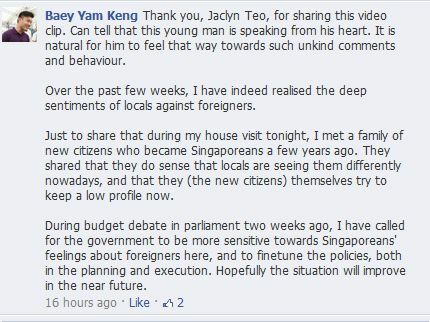 His comment has outraged Singaporeans, who questioned MOE policies. Some have even called for Sun’s scholarship to be revoked. Angelo Marc Jandugan has implored PM Lee (on his Facebook page) to ignore the ‘noise’ made by Singaporeans and continue his ‘good policy’ of bringing more foreigners into Singapore. A massive outcry has erupted over insensitive remarks made by this Philippino new citizen Angelo Marc Jandugan, prompting many irate Singaporeans to lodge complaints against him on his employer Deutsche Bank’s Facebook page. 7) Chinese embassy expresses regret over Ferrari accident – Watch your conduct and respect local laws. While the Singapore police was quick to arrest a 13 year old Singapore girl for burning the Singapore flag, no action was taken against this PRC new citizen family yet for displaying the PRC flag publicly. These are just the tip of the iceberg. Many such encounters are on the rise and go unreported. Behaviour like this may be acceptable in China but is not the accepted social norm in Singapore. Singaporean asks PM Lee: Why are you asking us now to solve your problem?